Pictureka Rules Overview: Sure, Where’s Waldo is fun, but Pictureka puts your “I spy” skills to the test in this visual scavenger hunt for ages six and up. Arrange the 9 tiles in a 3×3 grid. Shuffle each of the three decks and place them within access of all players. Green and Red cards display multiple missions per card. Prior to beginning, decide which mission players will be completing–top, middle, or bottom. Determine who will go first. Play will continue to the left. Determine how many rounds of each color card you will play. For shorter games, choose fewer rounds and more rounds for longer games. Play all of your blue-card rounds first, then proceed to green, and finally red. Draw the top card of the color you are playing and complete the mission described on the card. Each color of card has separate mission rules, explained in the next section. The player who wins the mission keeps the card, and play continues to the left. Once you’ve played the set number of rounds for all three colors, count the number of cards you’ve won. The player with the most cards wins. Begin your turn by rolling the die. If you’ve lost the die that came with the game, 1&6 are red, 2&5 are green, and 3&4 are blue. Draw a card of the appropriate color and begin the round. The winner of the mission keeps the card, and play continues to the left. The player to first win six cards wins the game. Pictureka Special Rules: There are two images on the cards that require an action to be performed on the tiles. The first image is an arrow with points at both sides. This arrow indicates that the player whose turn it is can switch the position of any two tiles. The second image is of an arrow curving to the right. This arrow indicates that any tile may be flipped over by the active player. Pictureka Missions Rules: There are three separate missions cards, each played differently. The blue mission cards are “Find it First” cards, where players compete to find the object before any other player. All players compete in this mission, with the first finding the object and yelling “Pictureka!” winning the card. Green mission cards are “Personal” cards and are only completed by the active player. Flip the timer and search for all of the objects on the mission card. If you find them all before time runs out, you win the card. Red mission cards are “My Tile” cards. Two tiles are given to all players if there are four or fewer participants, but only one tile is given if there are five or more players. 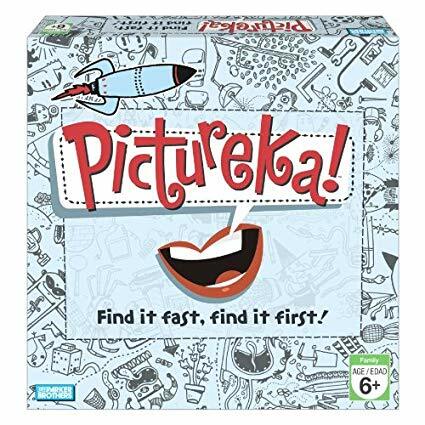 Players then compete to find the object on the card first, yelling “Pictureka!” when they find the mission object, which wins them the card. Cheater, Cheater, Pumpkin Eater: If a player shouts, “Pictureka!” before pointing to a tile, or if they point to a tile that does not contain the appropriate object, they are dirty cheaters. As a group, the remaining players decide an appropriate punishment, like losing a card they’ve won, or begging for forgiveness on both knees. Be as gracious or as vindictive as you would like.